We present a 36-year-old, unmarried man, who had low bone mass detected during evaluation for low backache in 2014. There was no history of trauma or fractures in the past. He also complained about the absence of facial hair and small external genitalia. He was the eighth child of a non-consanguineous marriage, born following a full-term normal vaginal delivery with no perinatal complications. His developmental milestones and physical growth were comparable to his peers during childhood but after the age of 12 years, he started to outgrow them. He did not have early morning erections and had no gynecomastia. He had normal smell, vision, and no neurological deficits. He had eunuchoid body proportions, his sexual maturity rating was Tanner stage 2, had no facial hair, a stretched penile length of 5 cm, and bilateral firm testes measuring 2 cm 3. Investigations revealed hypergonadropic hypogonadism (FSH-66 IU/l) and the karyotype was 47XXY. A diagnosis of Klinefelter syndrome was made. His bone biochemistry was normal. 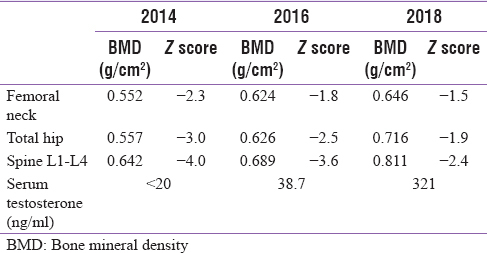 He was initiated on parenteral testosterone and his bone mineral density (BMD) was assessed serially [Table 1]. The BMD increased progressively at both the femoral neck and lumbar spine while only on testosterone therapy. This was despite the fact that therapy begun many years after puberty and continued to improve on 4 years of follow-up without the addition of any antiosteoporotic agent. Testosterone regulates bone metabolism indirectly by aromatization to estrogens and directly acting through the androgen receptor. Deficiency of testosterone around the time of puberty, as happens in Klinefelter's syndrome, results in premature male osteoporosis. However, several other factors have been shown to play a role in the low bone mass associated with Klinefelter syndrome including low vitamin D levels, low androgen receptor expression, Cytosine, Adenine, and Guanine repeat length, low INSL3 levels, and unfavorable fat/muscle ratio. Treatment options for men with Klinefelter syndrome having low testosterone levels undoubtedly include testosterone therapy to restore the levels to the mid-normal adult range. Studies have shown discordant results about the impact of testosterone replacement on BMD., The current recommendations suggest adding another agent with antifracture efficacy such as a bisphosphonate or teriparatide in hypogonadal men at high risk of fracture who are receiving testosterone therapy. This recommendation stems from the proven efficacy of such agents in postmenopausal osteoporosis and the absence of fracture prevention data with testosterone therapy rather than from direct studies of these agents in hypogonadal men. Moreover, the time point of adding an anti-osteoporotic drug in such patients is ill defined. Hence, there is a need to have well-designed trials to precisely define the roles and targets of testosterone therapy and those of antiosteoporotic agents in hypogonadal men with low bone mass. Ferlin A, Schipilliti M, Di Mambro A, Vinanzi C, Foresta C. Osteoporosis in Klinefelter's syndrome. Mol Hum Reprod 2010;16:402-10. Jo DG, Lee HS, Joo YM, Seo JT. Effect of testosterone replacement therapy on bone mineral density in patients with Klinefelter syndrome. Yonsei Med J 2013;54:1331. Wong FH, Pun KK, Wang C. Loss of bone mass in patients with Klinefelter's syndrome despite sufficient testosterone replacement. Osteoporos Int 1993;3:3-7. Watts NB, Adler RA, Bilezikian JP, Drake MT, Eastell R, Orwoll ES, et al. Osteoporosis in men: An endocrine society clinical practice guideline. J Clin Endocrinol Metab 2012;97:1802-22.